Those who pay attention to our social media feeds – namely Twitter and Facebook – may have spotted our “big news” of the week: we’ve put together a season of parties with very special guests, called Bedmo Disco presents… at Big Chill Bristol. What’s more, the first party is set to take place on Easter Sunday, April 20th. It goes without saying that we’re rather excited about this. When Big Chill Bristol’s general manager came to us and offered us the opportunity to program a series of parties with special guests, we understandably jumped at the opportunity. We spent a lot of time thinking about DJs who would not only fit our vibe, but also that inspire us. DJs who may also be producers or musicians, but first and foremost can rock a party hard while taking us on a journey. We were interested in booking people from that select band of DJs whose style combines an obsessive crate digging mentality with an ability to educate, entertain and, above all else, get the dancefloor rocking. After spending weeks hammering out emails and chatting to DJs, agents and managers on the phone, we’ve put together what we think is a pretty darn tasty line-up of guests. We’re not going to announce them all at once, but suffice to say that our guests come from around the World, including such hotbeds of disco and dance music talent as New York and Amsterdam. We think you’ll be impressed, and you certainly won’t want to miss any of them. 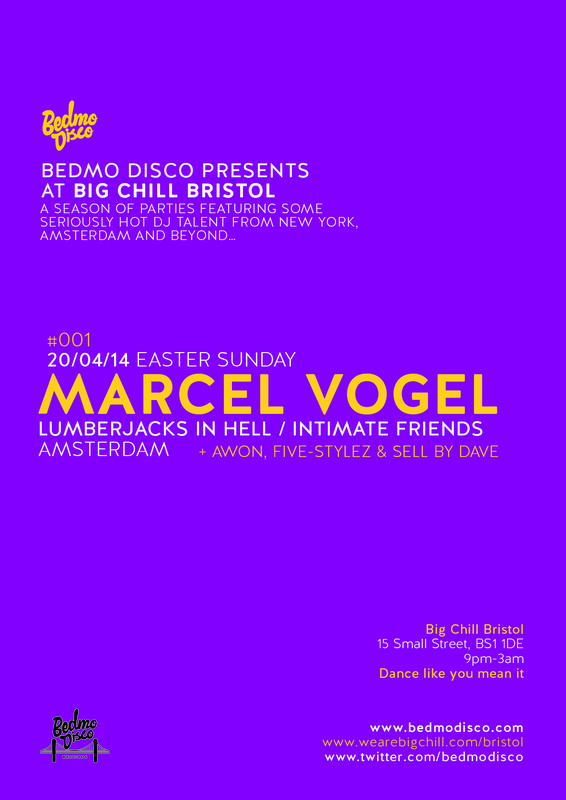 You can find the dates of all the forthcoming Bedmo Disco presents at Big Chill Bristol parties here. We’re particularly excited by the launch party, which will take place on April 20th (Easter Sunday). It features a DJ we’ve long admired, Amsterdam legend MARCEL VOGEL. Those who pay attention to the contemporary disco scene will have come across Marcel, possibly through his label, Lumberjacks in Hell. It’s one of the few edit-related labels worth bothering with. With strong links to the original Chicago house and disco DJs, as well as top contemporary talent, Lumberjacks in Hell frequently features edits that blur the boundaries between house, disco, boogie and soul. Other labels do this, of course, but few – if any – do it quite as well as Marcel’s imprint. It’s a clear sign of his A&R skills, but also of his own distinct style, which is so evident in his DJ sets – think percussion by the barrow load, hypnotic loops, celebratory builds and moments of thrilling release. He’ll drop original material, but you’ll also find quality cuts that breathe new life into forgotten and little-known gems. Oh, and expect soulful music in all its other forms, be it hip-hop, house, or raw funk. Marcel first got into music as a kid growing up in Germany, compiling tapes from his mum’s record collection and aspiring to be a B-boy. He got into DJing soon after, and as he got older began to put on parties. After moving to Berlin he promoted and acted as resident DJ at the now legendary LEGACY parties between 2003 and 2007. There, he began to develop his now familiar “soulful groove” style, joining the dots between raw disco, boogie, rare groove and house. 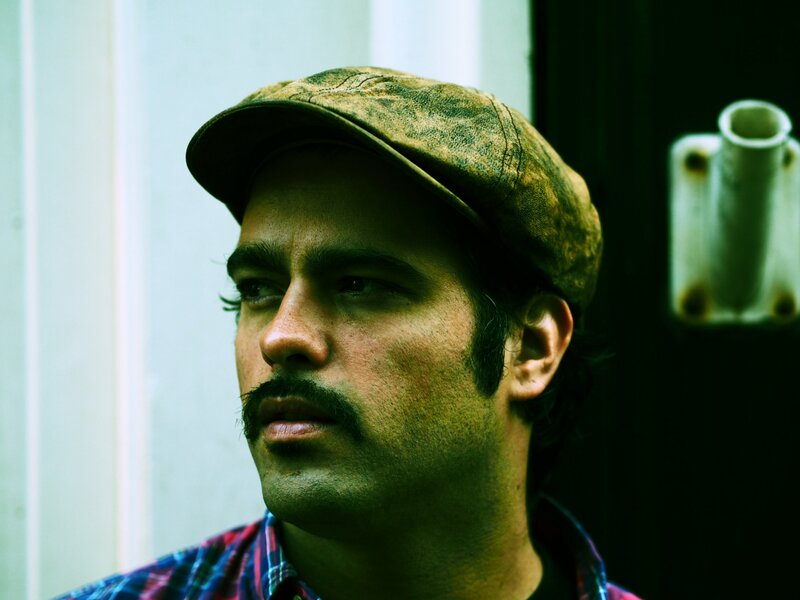 After spending three years in Switzerland, he moved to Amsterdam in 2010 to learn audio engineering. He became an integral part of the local scene, DJing regularly, hosting parties and promoting his new label, Lumberjacks in Hell. You should know the rest of the story. As we approach the party we’ll post some of his DJ mixes, including one he’s putting together just for us. You’ll be able to hear that on the April edition of our radio show on Invader.fm. The April party, which Marcel is headlining, will follow the same formula as the rest: the Bedmo Disco crew on the warm up, the guest smashing it, and happy faces all round. We can’t wait. These parties will start at 9pm, and be free to get in before 11pm. After that, it’s three quid in. Arrive early, as we have a feeling these events will be roadblocked – after all, it’s not often you get guests of this quality for free, or less than the cost of a pint. Stay tuned for more information. For now, get the dates in your diary. We have guests from New York in June and July, and you definitely won’t want to miss those! 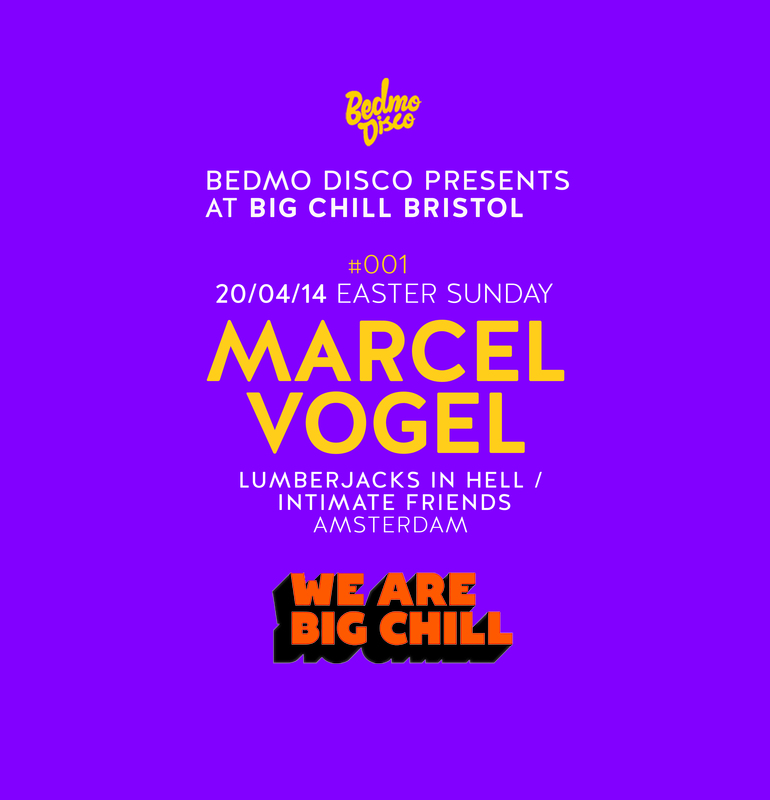 Bedmo Disco presents #001: Marcel Vogel takes place on Sunday April 20th at Big Chill Bristol.